Daily Illuminator: Announcing Munchkin Starfinder! October 20, 2017: Announcing Munchkin Starfinder! 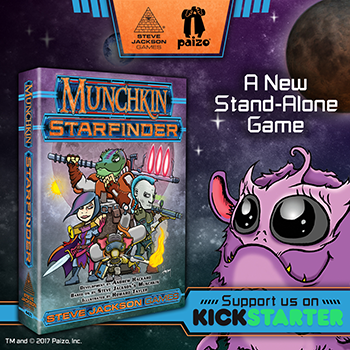 Gamers loved Munchkin Pathfinder, so Steve Jackson Games and Paizo Inc. are taking it to the stars! Paizo launched the Starfinder Roleplaying Game on August 17th at Gen Con. The Core Rulebook sold out in just 6 hours, selling more copies in the four days of the convention than in the history of Paizo's attendance. And now, Starfinder is the basis for a new Munchkin game. Munchkin Starfinder launches on Kickstarter on October 23. The 10-day project will fund both the 168-card core game and an expansion. Munchkin Starfinder will include new classes and races taken from the Starfinder Roleplaying Game. "This game has more classes and races than any Munchkin set we've ever done," said Munchkin Line Editor Andrew Hackard. "Players have over a dozen new roles to choose from." Howard Tayler, known for his webcomic Schlock Mercenary and his popular podcast Writing Excuses, illustrated both the core game and expansion. Munchkin Pathfinder debuted in 2013 and has become one of the most popular Munchkin games, spawning several expansions and accessories, including Munchkin Pathfinder: Truly Gobnoxious and Munchkin Pathfinder 2 – Guns and Razzes. The Pathfinder Roleplaying Game is one of the world's best-selling fantasy roleplaying games, in the true spirit of the classic dungeon crawl. The Starfinder Roleplaying Game is set in the same universe, centuries later – so while Pathfinder monsters are compatible with a Starfinder game, Starfinder features a lot more lasers, as well as artificial intelligence and space travel. "The looming threat in Starfinder is an alien race called the Swarm," Hackard continued. "Naturally, we incorporated the Swarm as a real threat to Munchkin Starfinder heroes." Gamers interested in the project can watch the Steve Jackson Games Kickstarter page for the project's launch!